The Woman in White heralds Justin’s death and the oncoming lottery, the strange and mandatory ritual where each generation of Collinses must choose a member to stay in a room haunted by the humiliated torture of Brutus Collins, the cuckolded patriarch from 1692. Gabriel contemplates escape only to be chastised by his brother, Quentin. 1841PT roars to the screen in an episode packed with interesting variants on familiar characters and new avenues of mythos. Departing from the slow-burn romantic handwringing that will eventually merge with the lottery story, we careen into the latter with slam-bang inciting incidents. Morgan on the rocks, declaring that Collinwood is a house of death (true) and then Justin flailing about in Melanie’s arms like a ghastly Falstaff in his death throes, all thanks to the Woman in White. Eventually, the dynamic of brothers is demonstrated as we see their sense of character and family evidenced by the threat of the lottery, and the show has brought us up to speed with a curiously effortless mix of immediate intensity and subtlety. Not to mention ghosts, coffins, and death in the clutches of existential dread and cool lighting. So far, the focus of the PT glimpses has been on Bramwell, Morgan, and Catherine. Logical choices, since these are somewhat relatable (or related to relatable) figures, and the Bramwell/Catherine conflict informed Barnabas’ choice to pursue Angelique. Now that we’re no longer tied to the main series, Dan Curtis and company can expand the vista. By locking in to a set of characters and causality, Dark Shadows became more and more limited by obligations to past choices. Whereas the first PT jaunt was an odd non-sequitur & excuse to shoot a movie, this feels very different. And it has to be. By default, the main timeline has more red lights than green. It’s a world in which Roger has reconciled with David, Carolyn is heartbroken into romantic paralysis, Liz is free from the fears of presumed murder, Barnabas exists sans Josette and Angelique, Maggie is off the show, and Quentin drinks more coffee than brandy. The trajectories of four years of storytelling have reached their targets. Armed with the knowledge that he no longer has to put Gothic melodrama in Mad Men drag to comfort audiences, Curtis can simply present the raw feed of the period, making it our first time jump that exists as its own context, without an ambassador from (or at least through) the present. He’s moving closer to soap storytelling as well, with an emphasis on torn loyalties, questions of paternity, alcoholism, and the challenges of inhumane obligations to family. Given the medium, I’m surprised it’s taken this long for the show to explore those avenues. It was inevitable, and what’s interesting is how Dark Shadows deals with the arguably more mature and challenging emotional landscapes… especially without the crutches and/or restraints supplied by the original ensemble of characters. As it turns out, it does it quite well. With a ghostly and teasingly unseen Woman in White heralding family curses, it’s very much Dark Shadows -- just concentrated. Maybe we don’t need multiple Widows again. One might do. Maybe a single, haunted room is a more focused threat than an entire house, particularly if you have to spend the night in it to save everyone. The concept of romantic betrayal will continue, but now the emphasis is on Brutus’ masculine wrath rather than the fallout of feminine umbrage, as we get with Josette, Jenny and Beth. With the entire family having to pay, generation after generation, that wrath is an intimidating contrast. And it’s a secret only to an outsider like Catherine. Unlike the reaction to past supernatural incidents at Collinwood, this is not Gilligan trying to convince the other Castaways that the west wing is haunted. No need. We’ve reached a point with the show and its audience that we can simply jump in with both feet and the whole ensemble knowing the truth. The program has shown us how they deal with secrets. Now, how do they deal with truths? The show presents a gallery of reactions to the lottery and to each others’ coping mechanisms. Brutus is a sad and furious fountainhead of this legacy, whose 1690’s roots have a strangely ancient quality compared to almost everything else we’ve seen. Dead or alive, he still dominates the family and reduces theoretical patriarchs like Justin to bobbing around Collinwood in an emasculating frock, supported by an impossibly svelte Melanie and needing a decent shave. A strange and sad ending, and we’re thrust right in. And yet, it doesn’t feel forced nor overloaded, a danger of the 1840 sequence. Mirrors grow subtler, here, too. And bolder, depending on the case. Quentin I is not the opposite of Quentin II… but 1841PT Quentin might be the most upstanding man of the three. It’s jarring to hear him castigate anyone for cowardice and drinking. But this Gabriel is implosive, rather than explosive, and Chris Pennock gets to explore his most straightforward and realistic character, yet. When used properly, the PT sequences are not reflections as much as kaleidoscopes, and here, it’s twisted to create what the show might need most at this point -- a new pilot for a new continuity, replete with the ghoulish and the guilty. Old lessons echo and new possibilities are ripe for exploration. The cast is heavy on familiar men put into roles arguably sadder and more contemplative than we’ve seen before, with the high volumes left for the shrill newcomer, Morgan. He’s a figure from melodrama in a Chekhovian world, and his efforts open up the space for David Selby, Pennock, and Jonathan Frid to play subtler notes. It’s not your father’s Dark Shadows or even your Dark Shadows. It’s a program for a generation that never got to inherit it. But it feels as if the cast sees this as a new opportunity for reconsidered choices, and they make the most of it. 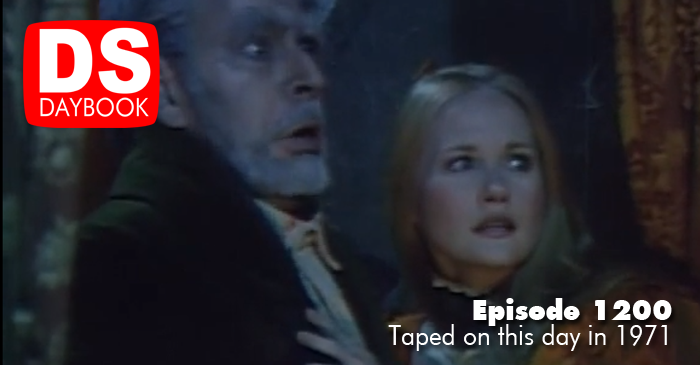 When the show should be flagging, it feels strangely fresh and ideally timed, allowing the pain of Angelique and Barnabas to resonate as an unbroken note while continuing the themes and fun of the program. This episode was broadcast Jan. 29, 1971.